Lismore flood: St Carthage’s Cathedral (centre) is clear of floodwaters in Lismore early in April but the two sites of Trinity Catholic College (St Joseph’s in foreground and St Mary’s behind the cathedral) are inundated. 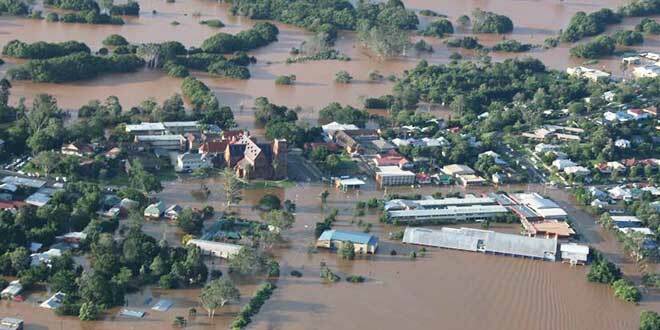 TRINITY Catholic College principal Marist Brother John Hilet has praised the college community for the spirit it showed in the wake of Lismore’s devastating floods earlier this month. “This had disastrous results for (the college) with both sites, St Mary’s and St Joseph’s, inundated with water,” he said. “The initial prediction was for moderate to major flooding, but this was far surpassed by the eventual peak of 11.5 metres. Br Hilet said the community spirit for which Trinity was renowned came to the fore in the days following the flood. “With up to three hundred volunteers including parents, students, friends, extended family and our own staff, the effort has been mammoth to say the least allowing the clean-up to progress quickly,” he said. 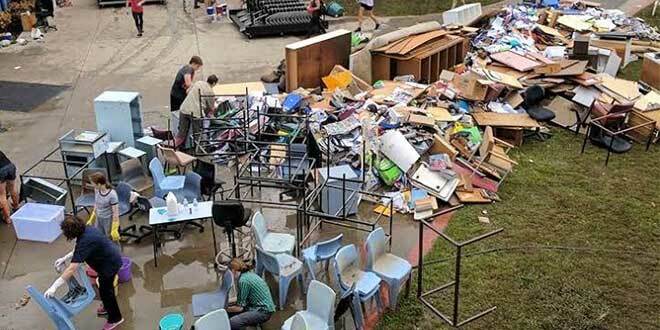 A helping hand: volunteers pitch in to help clean-up at the St Joseph’s site after floodwaters have receded. Br Hilet said that, as he reflected on the experience, he “could not help but be struck by the upcoming season of Easter”. “Easter reminds us that from death comes new life and while we are experiencing a difficult time at the moment, I have no doubt the college will spring back from this situation to continue its great tradition into the future,” he said. Br Hilet thanked the Marist Brothers and Marist school communities from across Australia for their many messages of support during the ordeal. “I ask that you keep not only Trinity Catholic College Lismore but also all those affected by the flood in your thoughts and prayers,” he said. Flooded school: Water rises high into the St Maryís site of Lismore’s Trinity Catholic College.